Is your little girl ready to sail the high seas? She's got her pirate costume, her pirate sword, and even her treasure map. But does she have her hat? A great pirate has to have a great hat if you ask us. Pirates always need to have the right headgear - what's a pirate without their hat? Not any kind of pirate we've ever seen. 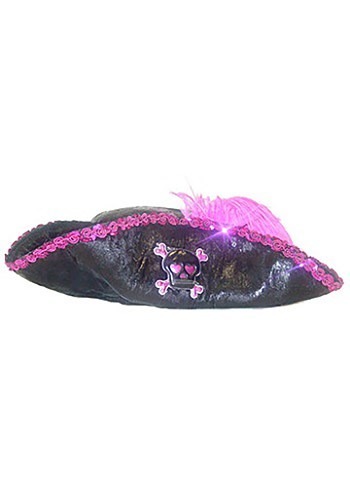 So top off her pink buccaneer costume with this Kids Pink Caribbean Pirate Hat. It's the perfect accent to make sure her costume is worthy of sailing the Caribbean in search of treasure! This girl's pirate hat is perfect for sailing the high seas or just running around the neighborhood gathering candy and pillaging your sibling's candy bag. This pirate hat accessory is made of black polyfoam with a shiny faux-leather finish so it looks like the real deal but is comfortable enough to wear all night long. The brim of the hat is edged with a deep pink sequin braid for added detail. The black skull and crossbones applique on the brim and pink feather take this pirate hat to the next level.